Pioneer Water Tanks has supplied water tank solutions for all types of farming, domestic and agricultural applications since 1988. Our exclusive AQUALINER® Fresh tank liner protects water to keep it fresh and clean for longer. The embedded Antimicrobial technology in the tank liner prohibits contamination growth in the water, along with being BPA-free and NSF-61 certified for drinking water. Designed for harsh and demanding conditions, Pioneer Water Tanks are manufactured using strong and durable, fully recyclable 100% Zincalume® or Colorbond® steel. Our range of tanks are available from 9,000 to 97,0000-Gallons in our standard range or can be custom built up to one million gallons. We can provide full lines of commercial accessories to make your water supply multi-functional including fire fittings and adapters. Our California wide accredited dealer and installer networks deliver and install Pioneer Water Tanks on-site wherever they are needed. XL 08/02 9,907 15' 5" 7' 2"
XL 13/02 16,392 19' 9" 7' 2"
XL 15/02 20,243 22' 0" 7' 2"
XL 23/02 29,093 26' 4" 7' 2"
XL 30/02 39,626 30' 9" 7' 2"
XL 40/02 51,785 35' 2" 7' 2"
XL 50/02 65,567 39' 6" 7' 2"
XL 50/03 65,567 39' 6" 10' 7"
The Lago Giuseppe Winery was required to have additional water storage for fire flow requirement. WaterMark H2O Rainwater Harvesting provided this XL 30/02 Pioneer Water Tank with fire fittings for the Winery that fulfilled the permitting requirements. The Winery now has adequate water on hand in case of an emergency. Pioneer Water Tanks are NSF-61 Certified for drinking water storage with our exclusive, AQUALINER® Fresh tank liner that is embedded with antimicrobial technology. We offer water storage solutions that comply with the California Fire Code and the California Building Standards Code. This XL 50/02 Pioneer Water Tank has fire connections and is anchored to a cement ring beam for the property. The water is used for irrigation and drinking and will provide adequate water supply in case of emergencies. The Pioneer Water Tanks system at the Jordan Vineyard and Winery is made with Classic Cream™ COLORBOND® Steel to fit in with the aesthetic of the property. The XL 50/05 model has a capacity of 159,707-Gallons and a 39-feet, 6-inch diameter. This XL 50/03 Pioneer Water Tank has seismic engineering included and is anchored to a cement ring beam for the earthquake-prone area. The water storage system includes fire fittings as well as steel connections. The Pioneer Water Tank has a capacity of 97,148-Gallons. Watermark H2O Rainwater Harvesting designed and installed an XL 50/03 Pioneer Water Tank for Extron Electronics. This fire protection system was required by Orange County for fire flow. Pioneer Water Tanks America installed this system to provide for a home business in Ferndale, California. The tank stores the water for drinking and irrigation for the property. Firefighting nozzles were added to the system after the installation. Pioneer Water Tanks America installed this system to provide for a farm in Mendocino County, California. The tank stores the drinking, irrigation, and fire protection water supply for the property. The water storage system is installed on a cement ring beam with our commercial hold down kit. Watermark H2O Rainwater Harvesting installed this XL 50/03 Pioneer Water Tank on a cement ring beam. The water storage system has a 41-feet 8-inch diameter and a 10-feet 7-inch wall height. The commercial water system has additional valves and nozzles, including fire connections. This XL 50/02 Pioneer Water Tank is installed for a property in Humboldt County, California. The water tank has a total capacity of 51,785-Gallons with a 39\' 6\" Diameter and a 7\' 2\" wall height. This water storage system includes fire fittings for quick access in case of an emergency. 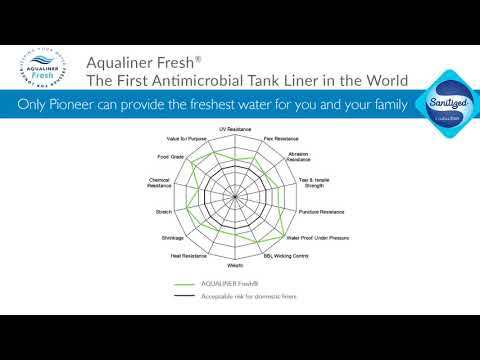 Pioneer Water Tanks, AQUALINER Fresh® antimicrobial tank liner is a world’s first to keep your water fresher, for longer. Learn about why the BPA-Free, NSF-61 Certified Tank Liner is considered the top of the line worldwide. The JR Ranch spans 1,000 acres in the remote mountains of Northern California. The awe-inspiring ranch is in Napa County, by the Russian Wilderness and the Pacific Crest Trail. The rural location required additional water storage with fire connections to provide an adequate water supply for fire flow. The project included a California Professional Engineer’s wet-stamped plans that detailed all of the components of the water system including the tank, piping size, type and routing with the capacity dedicated for fire protection use. Pioneer Water Tanks provided a 65,567-Gallon capacity tank with anti-vortex connections, a commercial water level indicator, and a brass main outlet/inlet. The water tank is anchored to a cement ring beam with seismic engineering. The water system doubles as a potable drinking water source because it’s protected within the Pioneer exclusive AQUALINER Fresh® tank liner. The AQUALINER Fresh® tank liner is BPA-Free and is NSF-61 Certified for drinking water storage. The innovative tank liner has embedded SANITIZED® antimicrobial technology to prevent biofilm, algae, bacteria and mold growth. The Pioneer fire protection water tank is permitted with Napa County. In case of emergency, the water system ensures water is always available for quick access. Lago Giuseppe Winery is a family owned and operated winery and event venue located in the heart of the Paso Robles Wine Country in Templeton. The winery venue is in an area that is wildfire prone and is required to have water storage fire protection. Finding a sustainable water solution to protect their beautiful property from California’s impending fires and ongoing drought and water scarcity was paramount to the owners of the winery. Lago Giuseppe decided on a Pioneer Water Tank as the ultimate solution for their water storage needs. With a capacity of 40,000 gallons the tank that was installed holds plenty of water for both domestic and fire protection at the ready. Lago Giuseppe relies on water from a well, brought up by a pump and stored in the Pioneer Water Tank above ground for easy access. The water tank is engineered with an eight-inch outlet with an anti-vortex fitting and easily-accessible fire connections for high volume emergency usage. The tank features an innovative, NSF-61 certified liner, Zincalume® body, and roof with fascia that protects the roof’s edges and adds to the overall aesthetic look of the water tank. Zincalume® Steel water tanks have a 200% longer lifespan than galvanized tanks, according to extensive tests by BlueScope Steel. Watermark H2O Rainwater Harvesting installed the two-ring tank on a concrete ring beam. This ARCSA-accredited company based in Santa Cruz focuses on sustainable water systems for residential and commercial applications. Watermark H2O provides Coastal California with exceptional service and solutions for rainwater harvesting, above ground well water storage, fire protection, commercial applications, irrigation and more. With the successful tank installation complete, Lago Giuseppe continues to be a picturesque premiere event site, now well-protected by a fire suppression tank. Known by locals as, “Middle Earth”, Lago Giuseppe has a sustainable water storage tank will last for the ages. Pioneer Water Tanks work with a local dealer and installer network throughout California. Our Dealer Direct model is based per project to offer the best possible price to the end client. Our water storage systems can come turnkey standard or with custom accessories for specific needs. Please call Colin Chatfield at (916) 425-5205 or by email at Colin@PWTAmerica.com for your best price per gallon on water storage. Santa Rosa, CA	 507	 Pioneer Water Tanks America provides quality, long-standing water solutions. We will showcase our exclusive AQUALINER® Fresh tank liner that protects water with embedded antimicrobial technology, along with being NSF-61 certified for potable water storage. Include our wide fire protection options to your water system, or other commercial accessories for a multi-functional water tank. Call Colin Chatfield for pricing at (916) 425-5205.
" Scott, I want to thank you and your team for your quick and professional service. The current water shortage and rising water prices have forced us to develop our groundwater resources. The storage capacity of our new Pioneer tank will allow us to utilize our well water to the maximum. Three things sold us on Pioneer tanks: First, competitive pricing: The Pioneer tank came in at about half the cost of a regular metal tank and a third the cost of a concrete tank. Second, innovative design: Pioneer’s liner system addresses corrosion problems associated with high chloride levels in our water. The low-profile tank is attractive and unobtrusive on the landscape, and comes with a 20-year warranty. Third, rapid construction time: Our 20,000 gallon Pioneer tank was erected and ready to fill in one day. wholeheartedly recommend Pioneer tanks for anyone needing water storage. Please feel free to reprint any of the above as it is useful to you. Sincerely, Gail Pressnall, Owner of Santa Paloma Groves "
" “Fantastic business! So professional and friendly. They get the work done so quickly and efficiently. You can tell every single worker puts in the effort and contributes to project. The foreman on the job, whoever it may be at the time, is so easy to communicate with and makes sure you’re satisfied with the work. I had a rather big tank being built and they went out of their way to extend their work days into the weekend to make sure it was finished and built quickly without delay. 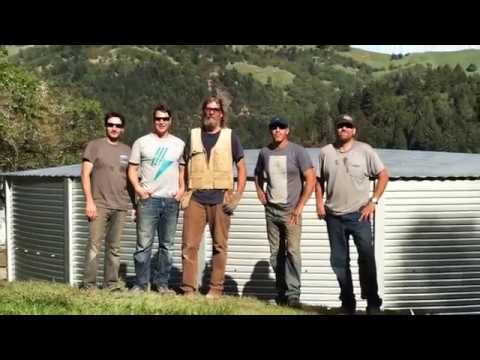 Great guys and great way to save water!” - Belle Weigel, speaking on local dealer Watermark H2O Rainwater Harvesting\r\n "
Residential and commercial Pioneer Water Tank project case studies with locations all around California.